This is supposed to be a diatribe about a journey that went awry. It may as well stay true to my intention, or it may branch out into areas that I don’t know yet. I am composing this article on my phone, tapping gently on a screen, while my mind tries to avoid the nearby borders of grievous anger. Let me begin. I have an appointment scheduled for Tuesday morning in Abuja, so I decided to leave the Garden City this morning (Monday) by road. There are two possible questions that some persons would ask. “Why didn’t you travel a day earlier?” Well, let’s say there are some situations where even the best planner would be limited by external factors over which the person has no control, especially if such a person is unwilling to leap without looking. The second question would be: “Why not take a flight?” Let’s say there’s no pocket-friendly answer. So I reached Teile Express’ park just before 9am, accepting my fate that I was going to reach Abuja late in the evening. I’ve named the company because this diatribe is also a review of their service. After I bought my ticket at the booking office, the lies began. A nursing mother was railing at the bookers for deceiving her into buying a ticket by misinforming her about the number of seats left. Thereafter, they pretended that they were set to go, using that as a delay tactic to wait for more passengers. While the passengers waited for the bus to leave, the driver stylishly left the bus. That was the lady’s grouse with them. After some rounds of railing, I and some other “new” passengers were asked to join the bus. At this point, the nursing mother asked for a refund, stating she didn’t want to arrive at night with her barely three months old child. Other passengers pleaded with her to reconsider. This she did, and the journey started around 9.27am. We were briefly joined by one of those persons I call “prayer vendors”. After his presentation and collection of offerings, the temporary passenger disembarked along the way. About an hour later, the driver suddenly stopped the bus and disembarked. He went around to check the right front tyre. This happened along the expressway linking Isiokpo and Elele in Rivers State. Satisfied, the driver returned to his seat. We had barely gone twenty metres from that spot when the bus suddenly swerved to the right. As the bus came to a stop at the right edge of the road, we looked behind to see a tyre on the road. I assumed it was a case of a pulled loosely bolted wheel, so I said, “It’s no deal. We’ll just come down and help to fix the wheel”. How wrong I was! As we came down, we realized our lives had just enjoyed a saving grace. Even if it had been just a wheel that pulled out, at high speeds, that would be potentially disastrous. 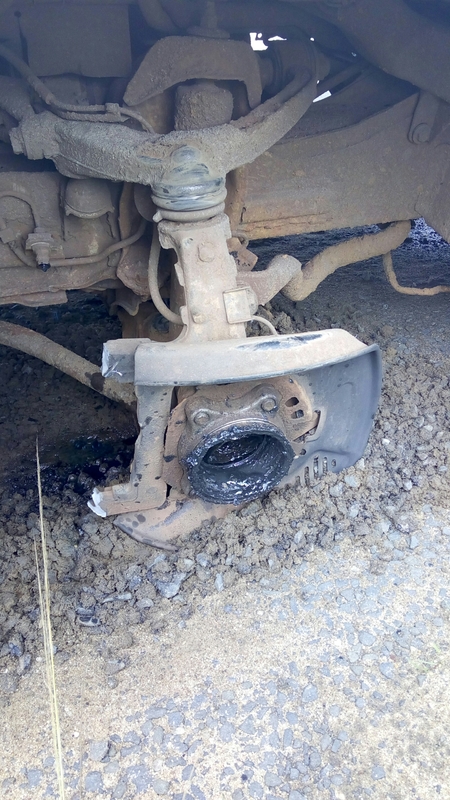 In this case, the front right caliper and flexible brake hose (conveying braking fluid) cut off, eject the tyre with its wheel, brake disc and pads; the entire assembly was lying on the road, smoking hot. 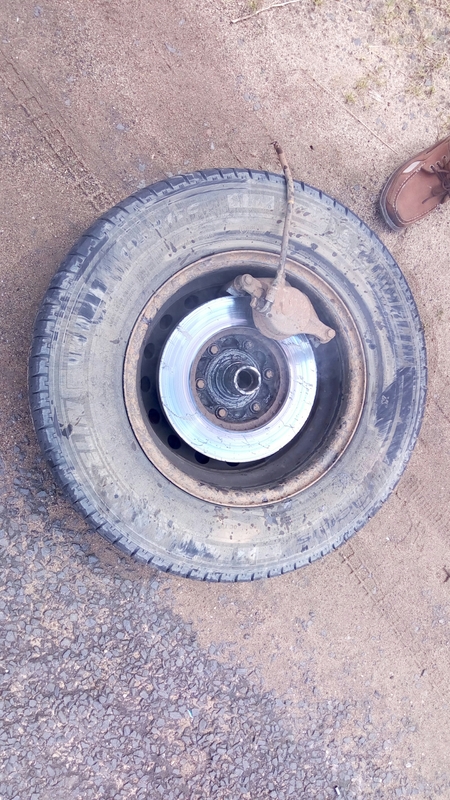 If not that the driver had not had sufficient time to accelerate after coming down to check that wheel, the story would’ve been different. When we had finished rejoicing that none was hurt, it was time to find a way out. That’s when Teile’s lack of customer service beat its chest. First, the driver did not bother to issue an official apology nor try to explain what happened, nor calm worried persons. He called the office to report the incident, and someone at the other end asked him to “manage”. He had to scream in vernacular that there was nothing to manage. After further discussion with the office, he informed us that a bus would be dispatched from Onitsha to come pick us, then convey us to Onitsha for onward movement to Abuja. To put this proposition in perspective, we were about an hour from Port Harcourt, while Onitsha was almost three hours away. We were incensed at this display of apathy. We asked him to tell his manager to arrange a bus at Port Harcourt to come convey us to Onitsha where we would join another bus to Abuja. We were told this was not possible because the company did not have any free bus in Port Harcourt, and apparently had no interest in chartering another bus from PH. We even asked the driver to ask his manager for approval to go to Elele, the nearest town, and charter a bus to take us to Onitsha. “Not possible” was the inhumane response. One passenger, quickly flagged down a passing bus in order to continue his journey. After about an hour, people were becoming incensed. The nursing mother accused the driver of insensitivity, for not caring that a suckling baby was stranded on an expressway. The expressway in question has a reputation for armed robberies and kidnappings. Luckily, the bus broke down near a military check point. In response, the driver accused the lady of being responsible for our misfortune. To him, since she earlier did not want to join the bus, her bad mind had succeeded in spoiling the bus. I and some others then gave him a really nice reprimand about customer service and his job as a representative of Teile Express. Then the spirit of violence took over. Some persons were talking of burning down the bus to teach the uncaring company a lesson. They reasoned that since the company was unwilling to spend a few thousands to hire a bus, or refund our fares totaling fifty thousand naira (ten persons), the company should be made to lose its five million naira Toyota Hiace bus. Some others talked about lynching the driver to teach him a lesson about wickedness. While these talks were ongoing, one passenger opened the dashboard, and picked a pair of pliers, intending to remove the bus’ license plates. Fortunately for the driver, in addition to the holding bolts and washers, the license plates had holding pins that the pliers couldn’t remove. While all these were ongoing, the enraged nursing mother, uninterested in continuing the journey flagged a car to take her, her baby, and her three companions back to Port Harcourt. Before leaving, she quietly slipped the bus’ registration documents into her bag, intending to use them as a bargaining chip to get her money back. Before the lady left, a military patrol van came along, and the driver enquired about our predicament. On hearing the company’s plan to send a bus from Onitsha, the soldier was enraged and ordered the driver to call his manager. The manager, after talking a load of crap, said he was on his way from PH, and would refund our monies to us. After issuing an ultimatum to the manager, the soldier left, with a pledge to offer the driver an elongated dose of frog-jumps if his manager failed to appear within a hour. The manager’s pledge turned out to be different shades of crap. The nearest he got to the place was his voice over the phone telling us he was at Omagwa, ordinarily a short distance away. As for the bus coming from Onitsha, after two false alerts in which we were informed the bus had “passed Owerri”, the bus finally arrived around 1.15pm. We then gave them our decision – take us back to Port Harcourt and refund our fares. An automobile mechanic had come as part of the Onitsha bus’ entourage with spares to fix the bad bus. While he began work replacing the damaged parts, the Teile guys informed us that if we wanted to return to PH, we would have to wait for the mechanic to finish fixing the bad bus. When we considered the time we had already wasted on the trip, the extra time to be spent waiting for the mechanic to finish, plus the fact that even if we were to get to PH, getting back our monies won’t be an easy task without some threat of violence, we decided to follow the new arrival to Onitsha. Sometime around 3:45pm, we got to Onitsha. The driver reached the Teile Park and suddenly disembarked; no information given. Then they applied different tricks including a phoney check of a front tyre, and a search for headrests that were safely tucked between the rear seats. This delay was to give them some time to prep new passengers to join the bus. The loading of cargo would then cause more delay, with protest from my group over the packing of humans and cargo like sardines, which by the way now have enough free room in their cans. It’s almost midnight, and we’ve just left Lokoja. Somewhere in Edo State, we had encountered a road washed away by rain. The driver had to rely on locals to pass safely. All that is now behind us. Very soon, we’ll get to Abuja, then I’ll post this article. I began writing this at Onitsha, and now I think it can end. In the morning I’ll do what I came to Abuja for, and all will be well. It’s just a fortunately unfortunate road trip – a daytime trip turned into a night journey. At least I got a story to tell. Nigeria palavar, everybody is affected even a day old child. God should have mercy on us o.